Leeds United fell apart in the second half at West Brom as they conceded four goals to be blasted off top spot in the Sky Bet Championship. After a goalless first half Albion consistently caught Leeds out on the break to run out 4-1 winners as they got their tactics spot on and proved the toughest opponents Marcelo Bielsa’s have found to date. United did manage an injury time consolation from Pablo Hernandez, made by substitute Samuel Saiz, but although they enjoyed 72 per cent of possession they were second best on this occasion. 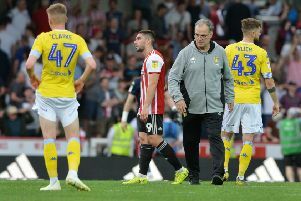 And Bielsa’s tactics could be questioned for the first time as he did nothing to stop the home team swarming through midfield to get at Leeds’ back three, which was put together because of Albion fielding two central strikers. The first half ended scoreless with Leeds initially struggling to cope with pace of Albion’s game, but coming into the contest more towards the break. The hosts threatened first in the sixth minute when Martin Phillips sent a 30-yard shot wide. Two minutes later Hal Robson-Kanu rounded Liam Cooper only to see his shot rise just over the crossbar. Tosin Adaribayo sent a volley wide when a corner was not cleared and seconds later Jay Rodriguez’s well struck angled shot was well saved by Bailey Peacock-Farrell. A further quick break led to Harvey Barnes hitting the side netting as it was one-way traffic at this stage. United finally fashioned a chance on 25 minutes as Pablo Hernandez got on the end of Ezgjan Alioski’s low cross, but fired over when well placed in the area. West Brom were quickly back on the attack when Rodriguez had time to size up a shot just outside the box and was unlucky to see the ball cannon back off the crossbar. Leeds began to enjoy more of the possession after that with Adam Forshaw seeing a 25-yard shot comfortably saved. Mateusz Klich, who had seen very little of the ball, suddenly found a good position in the box seven minutes before half-time, but after collecting Alioski’s pass his shot was straight at home keeper Sam Johnstone. United started the second half well enough and looked threatening initially, but Kemar Roofe and Klich failed to get shots away when well placed in the area and after Roofe’s claims for a subsequent penalty were rightly waved away the home team sprung a lightning break that ended with Robson-Kanu scoring with a well struck angled shot. Klich sent a 25-yarder wide for the visitors before Albion sprung another break when Phillips caught Klich in possession and ran forwards before unleashing a shot from 25 yards out. Peacock-Farrell should have saved it, but despite getting his hands to the ball he could not keep it out of the net. Barnes had two chances to extend the home side’s lead soon after, the first being blocked and the second being well saved by Peacock-Farrell. Craig Dawson sent a header over from a corner as United came under more pressure. They did relieve it a little and had a great chance to hit back as Alioski was played in, but he hit the side netting with his angled shot. But two goals in a minute ended any hopes they had of a comeback as Barnes raced through a gaping hole in the defence to finish confidently and substitute Dwight Gayle scored with a cheeky backheel with the defence all over the place again. Hernandez’s looping header from a delicious chip over by Saiz gave the Leeds fans something to cheer at last, but it was too little too late. Marcelo Bielsa admitted his team were second best as they failed to cope with West Brom’s way of playing. He said: “The opponent deserved to win. I think the score was a little bit exaggerated. “They could counter attack and we knew that was the main weapon of the opponent. “The kind of game we played was the kind of one we tried to avoid and when this happens you have two opposite project, the one of our opponent and the one of our team. “We couldn’t neutralise them and we knew they had these kind of features and that’s why I feel responsible for the kind of game we played. West Brom: Johnstone, Adaribayo, Dawson, Hegazi, Gibbs (Mears 88), Phillips (Harper 90+2), Livermore, Morrison, Barnes, Robson-Kanu (Gayle 79), Rodriguez. Leeds: Peacock-Farrell, Jansson, Phillips, Cooper, Dallas, Forshaw, Douglas (Harrison 73), Hernandez, Klich (Saiz 78), Alioski, Roofe (Roberts 66).